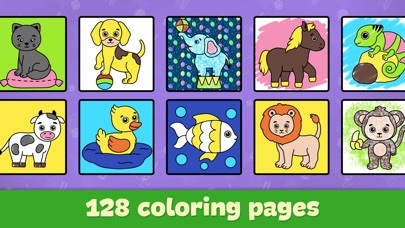 Creative coloring games for kids will help your child learn more about colors and coloring itself. 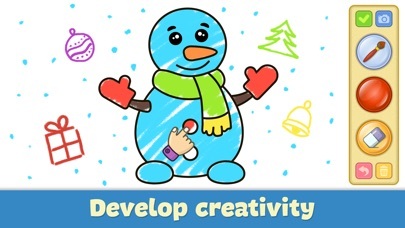 Let your child become a real artist and develop new talents. Coloring book for kids includes coloring activity which is friendly to the youngest and focuses on different objects that are surrounding kids everyday. 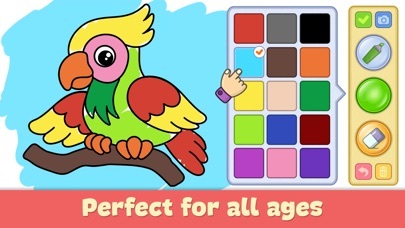 Furthermore, these games for kids contain a lot of coloring tools that will entertain your child with fascinating sounds and funny animations. 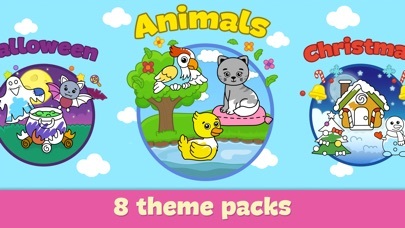 The following is waiting for you: - 8 topic packs with 128 coloring pages; - Easy coloring book for kids; - Different coloring tools for customizing; - Creativity development. Games for girls and boys are designed for children of preschool age and also suitable as games for toddlers of 2- 4 years old. All the activities were developed with participation of experts in the field of children education and include such educational games for girls and boys as fine motor skills and logic development. Enjoy! I would like to cancel my Subscribtion before it starts to charge me , how can I do that plz ? I cannot find a mute for music. And there are so few free colors. Not worth bothering with. I’m have fun playing your game! 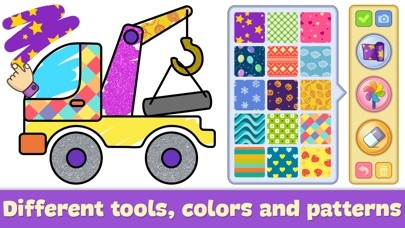 I like the tools and colors! Keep up the good work! Cannot save any coloring. It freezes when trying to save the coloring. When others have complained about this issue your employees suggest emailing support. How about actually fixing the issue? Prior to the most recent update, I would have given this ap 4 stars. I like it for my grandsons, ages 4 and 2 because it’s good for development of fine motor skills, is interactive and creative. I enjoyed using it, too. So I purchased the full version. For me to have given it 5 stars, it would need a mute option, and some blank pages or some with background scenery that a child could add his own drawings. Unfortunately, I’m very unhappy with the update. The color and pattern choices have become very limited. What were you thinking! After the last update there have been a lot of problems with the software freezing and not saving progress. While the limited color palate is nice for beginners it would be nice to have an expanded option. Also would be nice to have coloring in the lines turned off. As a toddler my kid doesn’t understand why she can’t draw when she wants to because she moved outside of the space she started in. I paid $7.99 for this app and it has gotten worse and almost unusable. If not fixed soon I will be demanding a refund and looking for a new app. I bought this for my granddaughter who is almost 4. She loved it! I did the update and it took away her favorite wallpaper...the pink one with the pink butterflies. She also had many choices of colors. Different shades of all the colors. Now there isn’t many to choose from. I wish I hadn’t done the update or even bought it if you were going to take away her choices! This was so worth it! I love to color! It’s awesome, I lovee this app! When I color them all maybe I’ll unlock one! I don’t know! This app is getting a 5 Star! My little sister Isabella just love this game! I’m just so impressed with the game ‘that is the best way to get the fun. It has so many options to choose to color! Also no adds! But if you want to unlock colors you need to pay for it. A fun way to spend a rainy afternoon!! My five year old son says he loves coloring in this game. It is so awesome! 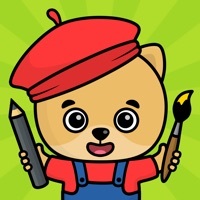 Good app but after update my daughter could not draw from scratch. Could you guys bring that back?